And finally… to the Amazon! Welcome to part six in my series, How to eBook, picture book edition. If you want to self-publish an eBook, you’ve come to the right place. This series, will take you from the writing and planning stage of a picture book, through illustration and production—all the way to publishing it as an eBook and making it available on Amazon. Parts I through V discussed everything from writing and illustrating your picture book to assembling it as a pdf file ready to upload/sell as an eBook on Amazon.com. Now on to part VI: Exploring the Amazon. Clicking images in this guide will enlarge them. By now you should have your mechanical saved as a flat pdf. Also you should have a jacket designed, full size, and saved as a 300dpi jpeg. You will need a high-speed internet connection for today’s step. STEP VIIIa. 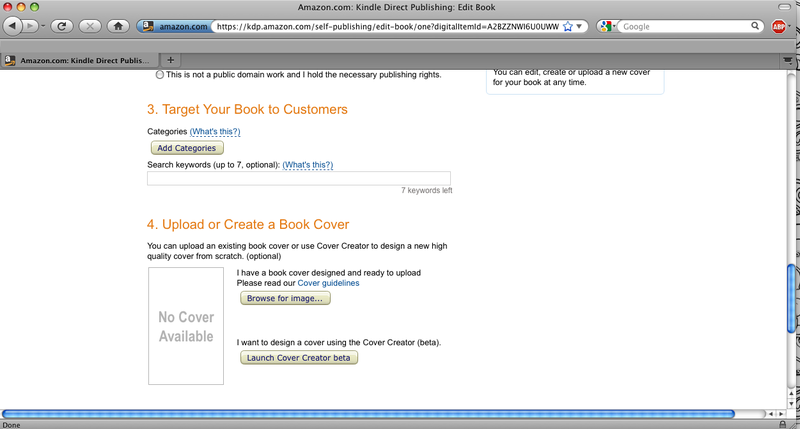 : Becoming an “Amazon” Author. 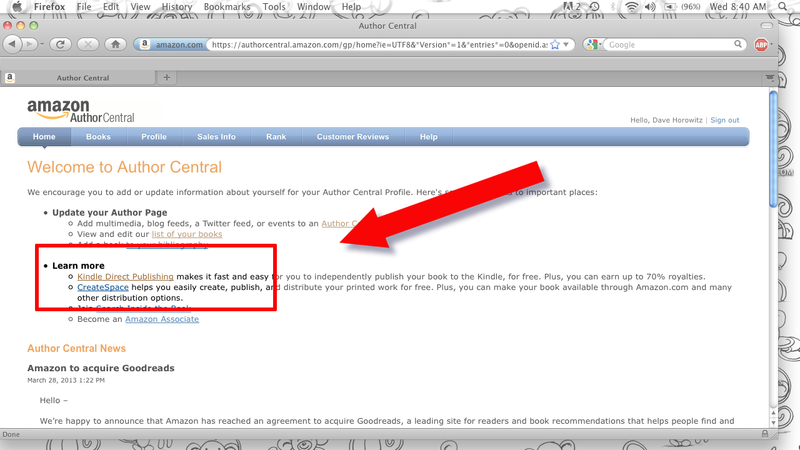 If you are already a published author, and your publisher sells your books on Amazon.com, skip ahead to STEP VIIIb. (You may also want to read the addendum at the end of this post). 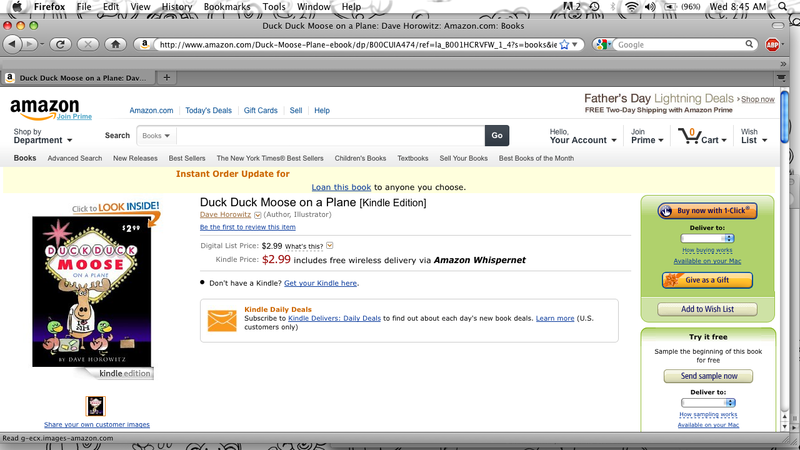 If this is your first product to appear on Amazon, you will need to set up an “author dashboard”. Fill in the appropriate fields. Navigate through the next few windows to build an Author Dashboard. Congratulations, you are an author. STEP VIIIb. : You’re an Author. If you skipped STEP VIIIa, you are an author. 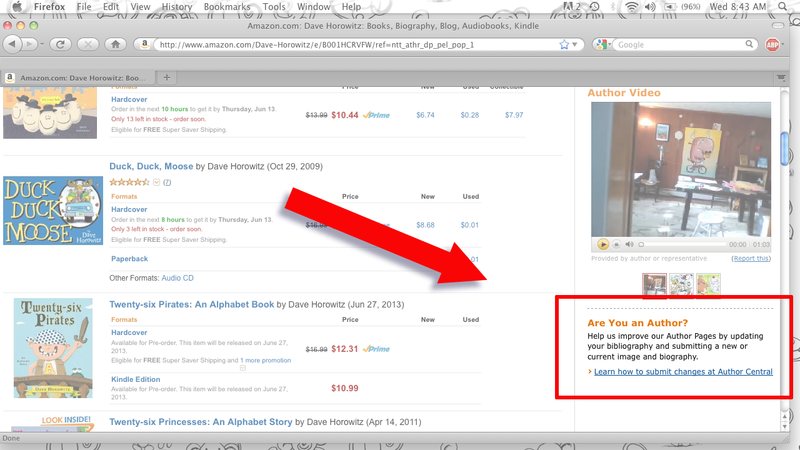 You already have an “author page” established on Amazon, whether you knew it or not. (If you look up one of your books, and click on your name, you will land on your profile). Once you are on your Author Dashboard you will find buttons to help build/edit your Author Page/Profile. (If I could figure this stuff out, so can you—so I won’t spend time on this). So let’s move on to publishing that eBook. Above is Page 1. (PRO-TIP: Establish yourself as the publisher, or create a “publishing company.” My “company” is the Half-Wit Press. I have a DBA making it official so I can cash checks Amazon will pay to this name.) Page 2 will be about pricing. Amazon makes this all very easy to understand. Again if I figured it out … you should be able to, too. Well… that’s it. Congratulations; it’s that easy! You’re published. NOTE: I have one last suggestion: Purchase/upload a copy of your eBook, and see that it functions properly before announcing it to your friends/family/fans. Mistakes will be made, so catch ’em before your critics do. They say if you give a man a fish he eats for a day; if you teach a man to fish… he starts drinking and buys a boat. It is in this spirit that I have created this guide. To future readers/artists who find this blog and find it useful, please tell me in the comments. If you use this guide and publish something, by all means link to your eBook in the comments. This guide was made because I’ve been lucky enough to see my work in print and wanted to share a little something to help you get there. I am in no way sponsored or affiliated with Amazon.com. If you want to support me and my efforts—you could always buy a book! That’s it for my guide on how to self-publish eBook-picture books. Now go publish something! AUTHORS ADDENDUM: Self-Publishing Out of Print Titles. My very first book, A Monkey Among Us, fell out of print the year after it was published. It won a few small awards, got nice reviews and sold quite well. Welcome to publishing! One of the sad truths about the business is that very few books actually stay in print for long. Unless you have a Harry Potter sized hit, you are only as good as your last book. That is why, as an author, you should either start drinking heavily or learn a trade. BUT, if you have out of print titles, there is good news (maybe GREAT news): It can be very easy to make them available again to your readers as eBooks. Over the years I received a lot of eMail from readers who found A Monkey Among Us at a library or somewhere and wanted a copy. It was such a drag knowing people wanted my work couldn’t get it. An eBook may not be the same thing—but it’s something. And anyway it got me to figure out everything you’ve read in this guide. So if you are an author with out of print titles here’s what you need to know: simply send your publisher a letter requesting a “reversion of rights”. Once you have legally received your rights back, ask your art director for the appropriate files. Some art departments will be cool and send you their art files from their archives for free (thanks HarperCollins)—others will charge you (thanks Penguin). Thanks Dave. A nice little insight to the process. I’m a freelance cartoonists with the desire (not ability) to produce a cartoon eBook and see how it runs against all the other cartoon eBooks out there. But I’m a bit behind the 8 ball as I don’t have inDesign or Acrobat, and my photoshop is an old steamdriven model V5. But I’m never one to let minor details hold me back, and will find a way to get to the same end result regardless of the damage to my liver. Thanks again, Dave, and I do like your humorous little bits you drop in around the instructions. Thanks, Ryan. I’m so happy people are discovering my guide and finding it useful. Not sure if it is the same in all 50 states, but in NY, to become a “business” all you need to do is go to your county clerk’s office and fill out a DBA (Doing Business As) form and pay a small fee. You will get a nice official certificate which will allow you to go to a bank and open an account as your business name. There are other legal options (LLC, Inc., etc. ), but I couldn’t tell you much about them; I think a DBA should be sufficient to get you up and running. Thanks for this cool info! 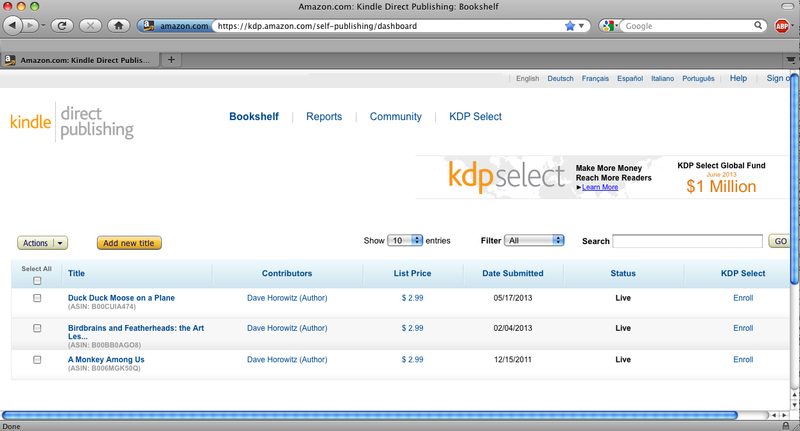 When I uploaded a few OP books, the rules for Kindle were .doc and nothing else. So now I know that PDF is allowed!! My only worry is the font size on the smaller devices when the .doc allowed people to make the font larger without the illustration getting too large. I just posted illustration, then text, then illustration, knowing the reader will just be scrolling down, not across. But because of that, I haven’t tried any pictures books yet, just early readers and when I had a double spread, I just made it a single page. So Yayy! And I’m with you on dinosaurs dealing with robots. And best wishes to you. Thanks, Drake. Glad my blog was useful. I just started receiving emails from amazon about their new kids book creator and look forward to trying it myself. It sounds like its pretty good and should eliminate a lot of tedious steps; not to mention the file size issue. Best of luck with Creature Clark and all your projects!